A few months ago I asked my students to list ten questions they had about playing music and the guitar. I thought that the vast majority of questions would overlap and I could make a simple top ten list. But guess what? Nobody asked exactly the same question. What I learned from this random sample of guitar players of all ages, levels and styles is that like snowflakes, no two musicians playing the guitar are alike, each one is unique! Why is there a nut? How do I make a solo sound interesting? How do I tune by ear? What are some common blues turnarounds? What is a triad and how many are there? 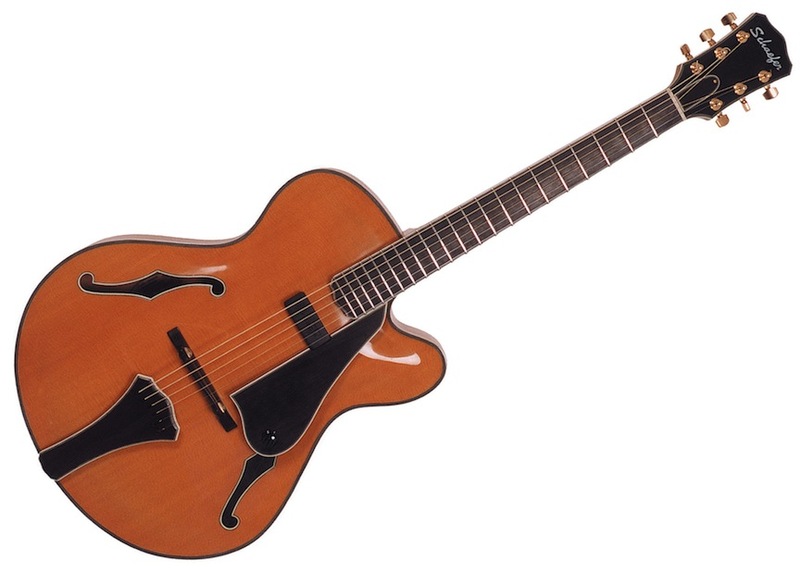 Which is easier to play, electric or acoustic? What does a whammy bar do? Why are there two dots on fret 12? Is learning to read music important? How much should I practice each day? How do I know what key I’m in? How do I overcome nervousness when performing? What is the definition of enharmonic? What is a moderately slow shuffle? What are flat wound strings? And finally, how can you play lots of songs on the guitar if there are only six strings? This last question reminds us that there are no stupid questions – only stupid answers! Now, even though these students didn’t ask the same questions, the questions they did ask fell into three broad categories which are sometimes hard to separate: music theory, guitar theory and the musician. Simply stated, theory is what and how we think about music and the guitar, and technique is skill or, how well we play. In other words, we play what we think and we think what we’ve learned. Now, if playing is the result of learning, and learning is the result of questions answered, then how exactly do we learn? The easy answer is: slowly at the speed of thought, transforming understanding into knowledge, in order to practice. Practice is simply the repetition of what we’ve learned until we can play what we’ve practiced at a steady performance tempo. Tempo is the rate of speed of the steady beat. Said a different way, we learn, then practice, and then play. So, what are we going to learn? 3. How to play what we’ve learned: dynamics and techniques, such as bend, slide, etc..
Future lessons will go into greater detail about the “what, when and how” of music and the guitar, but for now, let’s answer one of the student’s questions: What is the definition of enharmonic? Enharmonic is “the same pitch” but not the same letter or scale degree tone number. For example, G sharp (G#) sounds the same as A flat (Ab), however, in the key of C major, G# is tone sharp 5 (#5), whereas Ab is flat six (b6). As you can see, the letter and scale degree tone number of any pitch is determined by the key you’re in, but that’s another question. So, ’til next time, I invite all of you to send me your questions, or answers, which in turn will generate even more questions and answers. This is our dialogue ~ this is the Process of Learning. Guitar Image: Mike Overly Custom by Ed Schaefer Guitars. The Tone Note® Music Method for Guitar makes it simple and easy to play fun and exciting music on your guitar correctly from the beginning. On the cover of the Tone Note® Music Method for Guitar is a connect the dots picture of a bass which presents four very important ideas that a connect the dots picture teaches us: 1. start at the beginning, 2. continue in order, 3. the end connects to the beginning, and 4. when the last dot is connected ~ you can see the picture! These four ideas form the basis of this book. 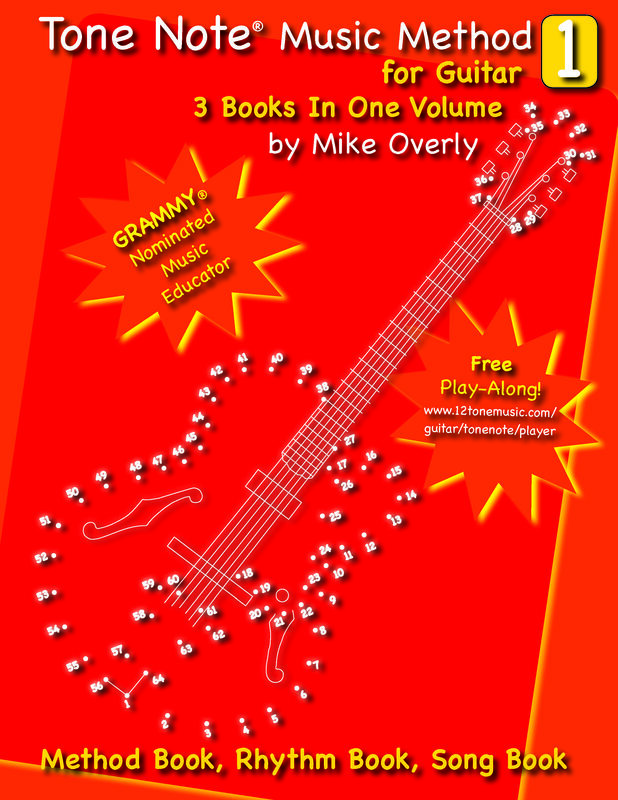 The Tone Note® Music Method for Guitar 1 contains a method book, rhythm book and song book. Each book is designed to present the benefits of the Tone Note® system with clear and simple step-by-step instruction. And each lesson within each book connects and continues with the last in a progressive order so that a person new to music and guitar will learn the symbols and signs of music quickly and develop the skill to play guitar easily. You will play and enjoy music and guitar from the very beginning just like you hoped you would and as you practice, progress and improve, the better you will get, and the better you get ~ the more fun you have! 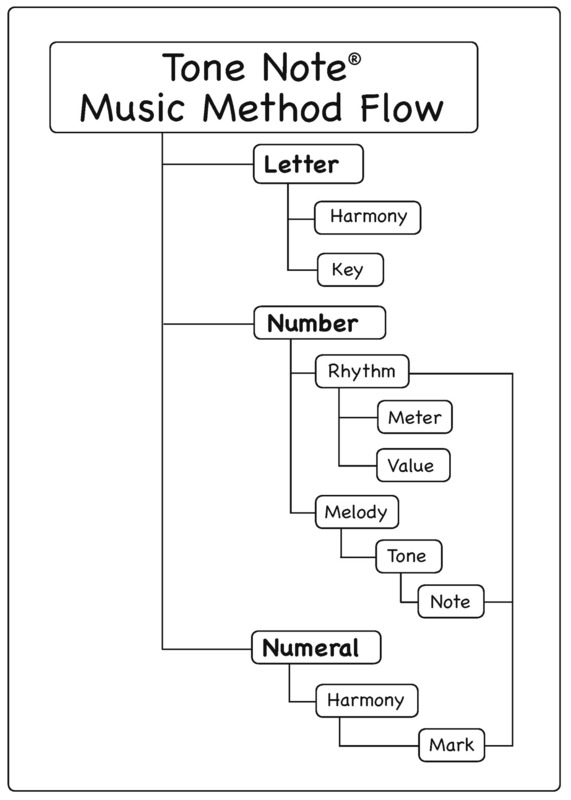 The purpose of the Tone Note® Music Method for Guitar is to introduce a beginner of any age to the simple pitch Letters, tone (scale degree) Numbers and harmony Numerals of music. The following flowchart illustrates this. The Tone Note® Music Method for Guitar answers this simple question: why is it so hard to learn to play guitar? Is it the fault of the student, or is it the fault of the instructor? The answer is neither, it’s the fault of false methods. So, let’s clean the slate and begin anew with a truly unique 21st century revolutionary music method for guitar. Over the centuries, guitarists have believed many false ideas and have kept adding more false ideas over time. This has created much confusion and has made learning music and the guitar a problem. The Tone Note® Music Method for Guitar solves this problem by keeping only the truth of the past and leaving the false behind. And the truth is, music is a simple language that may be learned easily by anyone of any age. All that is needed is a clear and simple step-by-step method which will introduces what you need to know, when you need to know it. In other words, a method that presents one idea and then connects it to the next idea. Learning in this manner guarantees that you do not have any gaps between your thoughts and ideas about music and the guitar. The benefit is, you will never feel overwhelmed or confused, and more importantly, you will never stop or quit! Understanding music on the guitar will always be easy for you. By the end of the Tone Note® Music Method for Guitar 1 your technique will have greatly improved and you will have gained a solid theoretical foundation that will last you a lifetime and prepare you to connect and continue with the Tone Note® Music Method for Guitar 2. Meet you there! ’til next time, have some Tone Note® guitar fun… I’ll be listening! The Tone Note® Music Method for Bass makes it simple and easy to play fun and exciting music on your bass correctly from the beginning. On the cover of the Tone Note® Music Method for Bass is a connect the dots picture of a bass which presents four very important ideas that a connect the dots picture teaches us: 1. start at the beginning, 2. continue in order, 3. the end connects to the beginning, and 4. when the last dot is connected ~ you can see the picture! These four ideas form the basis of this book. The Tone Note® Music Method for Bass 1 contains a method book, rhythm book and song book. Each book is designed to present the benefits of the Tone Note® system with clear and simple step-by-step instruction. 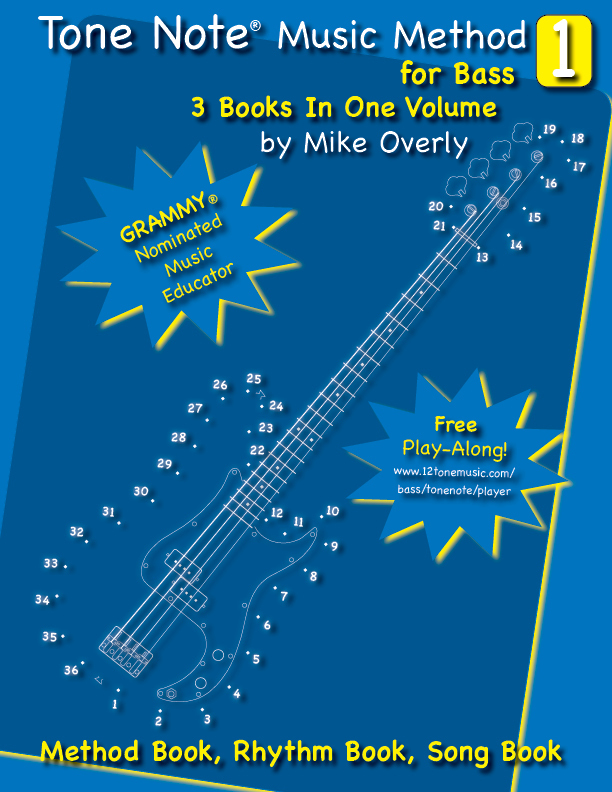 And each lesson within each book connects and continues with the last in a progressive order so that a person new to music and bass will learn the symbols and signs of music quickly and develop the skill to play bass easily. You will play and enjoy music and bass from the very beginning just like you hoped you would and as you practice, progress and improve, the better you will get, and the better you get ~ the more fun you have! The purpose of the Tone Note® Music Method for Bass is to introduce a beginner of any age to the simple pitch Letters, tone (scale degree) Numbers and harmony Numerals of music. The following flowchart illustrates this. The Tone Note® Music Method for Bass answers this simple question: why is it so hard to learn to play bass? Is it the fault of the student, or is it the fault of the instructor? The answer is neither, it’s the fault of false methods. So, let’s clean the slate and begin anew with a truly unique 21st century revolutionary music method for bass. Over the centuries, bassists have believed many false ideas and have kept adding more false ideas over time. This has created much confusion and has made learning music and the bass a problem. The Tone Note® Music Method for Bass solves this problem by keeping only the truth of the past and leaving the false behind. And the truth is, music is a simple language that may be learned easily by anyone of any age. All that is needed is a clear and simple step-by-step method which will introduces what you need to know, when you need to know it. In other words, a method that presents one idea and then connects it to the next idea. Learning in this manner guarantees that you do not have any gaps between your thoughts and ideas about music and the bass. The benefit is, you will never feel overwhelmed or confused, and more importantly, you will never stop or quit! Understanding music on the bass will always be easy for you. By the end of the Tone Note® Music Method for Bass 1 your technique will have greatly improved and you will have gained a solid theoretical foundation that will last you a lifetime and prepare you to connect and continue with the Tone Note® Music Method for Bass 2. Meet you there! ’til next time, have some Tone Note® bass fun… I’ll be listening! You are currently browsing the 12tonemusic blog archives for September, 2014.